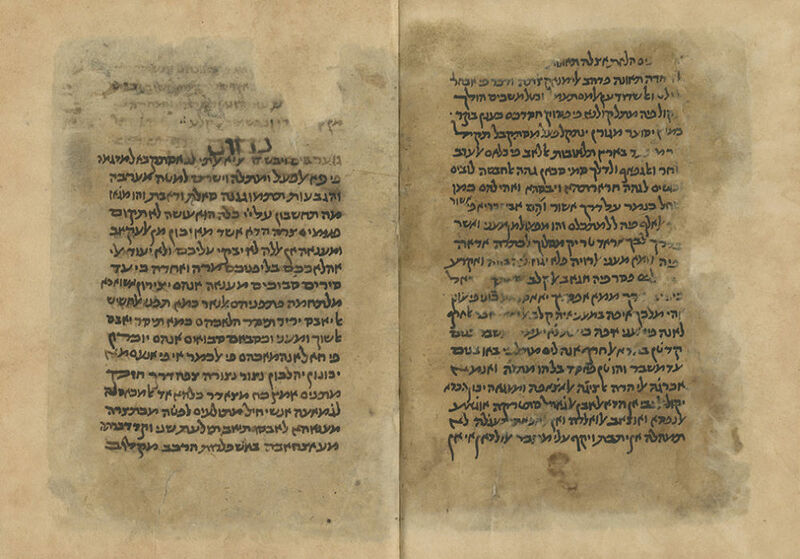 Four early manuscript leaves, fragments of the commentary of R. Yehuda son of Shmuel ibn Balaam. [Egypt, 12th/13th century]. Judeo-Arabic. Fragments found in the Cairo Geniza. Early, semi-cursive Oriental script. These four leaf fragments contain passages of the commentary of R. Yehuda son of Shmuel ibn Balaam to Trei Asar, on the books Hoshe'a, Nachum, Tzefania, Chagai and Zecharia. Two leaves have enlarged titles: "Nachum", "Chagai" and "Zecharia" (the last title is erased). R. Yehuda son of Shmuel ibn Balaam (1000-1070), a Spanish Torah scholar at the beginning of the period of the Rishonim, leading grammarian, commentator and poet, composer of the piyyut Bezochri Al Mishkavi. The ibn Ezra quotes him extensively in his commentary. The Rambam mentions him reverently in Igeret Techiat HaMetim: "Wise men amongst the commentators, such as R. Moshe Gikatilla and ibn Balaam may their memories be blessed, have preceded me in understanding this topic…". His biblical commentary in Arabic covers most of the Bible. The commentary did not survive in its entirety, yet parts of it were printed over the years. His book Taamei HaMikra was printed in Paris, 1565, by the Christian scholar Robertus Stephanus. These fragments provide missing parts of an incomplete chapter in the Poznanski edition. leaves (8 pages). Approx. 22 cm. Varying degree of damage. Stains and tears. Large tears to first leaf, affecting text. Tears to second leaf, with lighter damage to text. Tears and damage to last two leaves, primarily to upper part, affecting text. Damage professionally restored with paper. Written based on the report (enclosed) of Shlomo Zucker – expert on Hebrew manuscripts.